The composition of Dance in the Country is typical of Renoir's flowing style but in contrast to his earlier works, all three of his Dance paintings have tighter compositions, and lines are used to direct the viewer's eye towards the couple at the center of the canvas. Dance in the Country has a light composition and its figures are delicate. Movement is portrayed through the couples' body language and clothing and it appears that they are immersed in their own thoughts and space. Dance in the Country shows Renoir drawing accurately as well as adopting a simpler palette than in previous works. He admitted that this greater attention to drawing was the result of his need to change his technique following his trip to Italy. 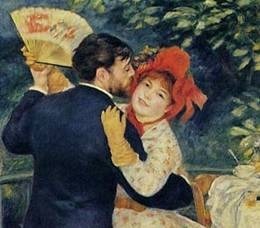 In Dance in the Country Renoir paints Aline Charigot - his future wife - using warm colors and the light colors of her dress contrast with the darkness of the man´s suit, forcing their images to the foreground. Renoir uses brush strokes up and around the couple´s feet and at the hem of Aline´s bright dress, where movement is depicted through the swooshing motion. Renoir's nuances of light and shadow come together to create a warm, sensual painting. Famous for his vibrant light and saturated color, he depicts the couple in Dance in the Country intimately and honestly. In true Impressionist style, Renoir suggests the details of this scene through liberally brushed touches of color, so that the couple softly fuses with one another and their surroundings.